Other items recently 'found' on the Red Planet include a floating spoon, a space crab and a Martian version of Stonehenge. 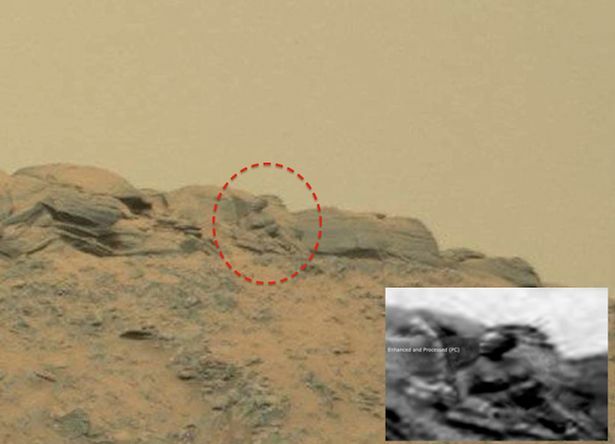 Curious: Is it really a Buddha statue sitting on the Red Planet?? A shape similar to a Buddha statue pictured on Mars is proof that intelligent life existed there, according to UFO hunters. The bods at UFO Sightings Daily have discovered this strange shape on the Red Planet and they think the world should take note. Scott Waring wrote: "This photo alone should be enough to convince the United Nations that intelligent life once existed on Mars, but NASA doesn't want anyone to know the truth, because they will be asked to share the info and technology that they have found." It's not the first 'sighting' of a Buddha statue on Mars. Several other fascinating Buddha-like images have been shared in the past. As Mr Waring notes: "This shows a face and head turned to its right, with breasts and a plump stomach, shoulders. "Very remarkable detail in this photo." Other things recently 'found' on Mars include a floating spoon, a space crab and a Martian version of Stonehenge.